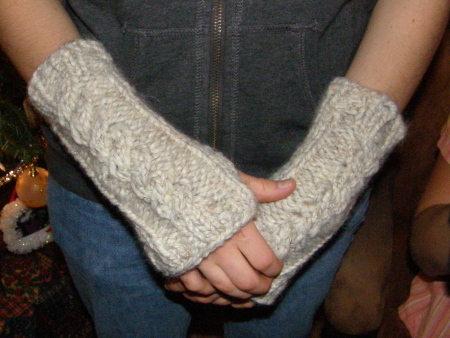 Emily’s (Jamie’s) Mitts…pattern found in How to Knit Cables on Looms, by Isela Phelps. I would love to know how to knit cables on a loom. I am a beginner and have only done hats and scarves but cables would motivate me to do more! I like Sharon woul like to know how to knit cables on a loom. I am also a beginner and have done only scarves. I too am motivated on how many things we can do with looms. I also would like to know how to add a color when kniting on a loom for a scarf. I’m on the middle of making these mitts and can not figure out the m1 increases. Can you give me any pointer on how you did it?